I feel so blessed the day that I stumbled onto this magnificent writer, Ms. Agnes Sligh Turnbull. This may seem funny, as I don’t really think she is necessarily a writer that attracts many male readers. Her stories are ones that tug at your heart, about family and relationships. I am the father of two teenage daughters, and believe me, I have learned more about how to relate to my girls, from Ms. Turnbull, that any of the many books I have read on marriage and family. In all of her books, Ms. Turnbull reminds us of what is truly important, that we love and honor our commitments to one another. I am so grateful to her for the many hours of relaxation I have had as I became friends with the characters she has created. This work stands far and above all others to me, at least so far. It is ” The Richlands,” published by Houghton Mifflin Company Boston, in 1974. It is only 259 pages, but no finer story have I ever read. It’s the tale of Jim Ryall, a well learned man, who chooses not to go to college and become a lawyer as his father had hoped for him, but to follow in his fathers footsteps of continuing to run the magnificient family farm, known as , “The Richlands.” Jim has two younger brothers, and a Scottish servant that live with him in the grand stone residence on the land. It is the story of lives within one life, of the triumphs and of the disappointments of living. It is a story, that when it finally ended on page 259, I felt a great loss, the kind where dear friends are moving away, and you realize that you will never see them again. This is how I felt about the Ryall family. “It was not quite sunset, yet the day was fading. A long shadow had fallen across the eastern end of the big stone house; the leaves of the maple on the path to the barn on one side and those on the way to the springhouse on the other all had a bright, quickening light on them, while all over the sky there spread a faint gleaming color which told that the sun would soon show his full glory. This is a beginning that one can rest in, with a steaming cup of coffee, and a big easy chair…and this is how I enjoyed this wonderful work. We all need order in our lives, and peacefulness. God has built this desire into us. We can get so busy in the day to day, that soon we have frenzied ourselves into an anxious grave. Ms. Turnbull allows us a time to relax, without interference, without car insurance commercials, or blaring radio ads. Reading one of her books is a time to forget all the cares of this world, and disappear for awhile. I enjoyed the time I was able to spend at “The Richlands,” and as I mentioned before I will miss them. I am better for having known them it seems to me. Isn’t that weird to say about fictional characters? 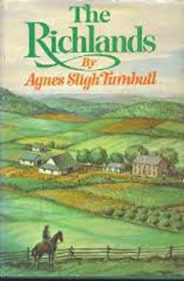 I think not, and neither will you after you read, “The Richlands,” by Agnes Sligh Turnbull. This entry was posted in fiction and tagged Farming, Richlands, Ryall. Bookmark the permalink.